The Muslim Women's Historical Heritage project which sponsored by the Human Development and Social Education Foundation (IGETEV) is helping to Islam. Despite the bad press that Islam receives in many parts of the world, one of the innovations it brought to the world was encouraging women to take up an important role in society. One of these women was Fatima al-Samarqandi. She was born in the city of Samarkand, the third-largest city in present-day Uzbekistan. Although the exact date of her birth is unknown, it is thought that she was born in the 12th century.Samarkand is one of the oldest inhabited cities in Central Asia and has always prospered due to being a key city on the Silk Road. Due to this position and the importance the city played throughout history, it is recognized by UNESCO as the Crossroads of Culture. Human activity in Samarkand has been traced back to as early as 40,000 years ago in the late Paleolithic age. It is thought that the city was first regularly inhabited from the eighth or seventh century B.C, and Alexander the Great conquered Samarkand in 329 B.C. when the city was known then as Maracanda. Until the eighth century A.D., the rule of Samarkand changed hands a number of times. In the final part of this era it has been determined that there were a number of different religions sharing the city. The religions that thrived in the city during this time included Buddhism, Zoroastrianism, Hinduism, Manichaeism, Judaism and Christianity, and after Islam was spread east it too became the dominant religion of the city. It is reported that during Abbasid rule, the secret of papermaking was learned from two Chinese prisoners, which led to the establishment of the first paper mill in the world in Samarkand. This invention, vital for the spread of culture and civilization, soon spread to the rest of the Islamic world and then to Europe. Control of Samarkand was lost by the Abbasids around 1,000 A.D. to Turkic tribes. In 1220, Mongols conquered the city and did not disturb the inhabitants, but it is reported that Genghis Khan killed all who had sought refuge in the castle and the mosque. He conscripted 30,000 young men and reportedly 30,000 craftsmen. It took the city many decades to recover and it was not until Timur made Samarkand his capital in 1370 that it regained its former glory. It was during this century and the following century that the most remarkable developments of the city occurred. Samarkand is renowned for being the home of a number of Islamic scholars and being the cradle of Islamic science, art and culture. Samarqandi was born before Timur conquered the city and before the city reached its true glory. She was born at a time when the city was under Mongol control – a time when the city had been pillaged and the people were oppressed. But Samarqandi is one of those remarkable women who managed to appear in every era and every region. She is also one of the remarkable women in the history of Islam who have been lost in the annals of history and who are overlooked today when talking about oppressed Muslim women or the "backwardness of Islam." One need only examine her life to see how unjustified such statements about this religion of peace, a religion that puts learning and knowledge above all else, really are. Samarqandi's legacy is one that has lasted nearly 1,000 years. She was the daughter of a great jurist and scholar, Mohammed ibn Ahmad al-Samarqandi, who wrote the famous work "Tuhfat al-Fuqaha," which is a classic work in Hanafi jurisprudence.Fatima learned from her father and memorized this work. She was so familiar with Islamic jurisprudence, the Quran and hadith that she was able to issue fatwas. The fatwas she issued were written in her handwriting and included her father's signature. When Fatima became of an age suitable for marriage, many rich and powerful men asked for her hand. It is reported that kings and princes wanted to marry this intelligent, knowledgeable woman. But Samarqandi's father wanted better for her. Ala al-Din Abu Bakr ibn Massud al-Kassani was a student of Fatima's father, and he wrote a commentary on "Tuhfat al-Fuqaha" called "Badai al-Sanai," an eight-volume work that was to become a classic.Samarqandi's father was so impressed with this work that he agreed to allow his daughter to become Kassani's wife. "Badai al-Sanai" was the dowry for her marriage. The new couple lived in the same house as Samarqandi's father, forming a home that acted as a jurisprudence committee. 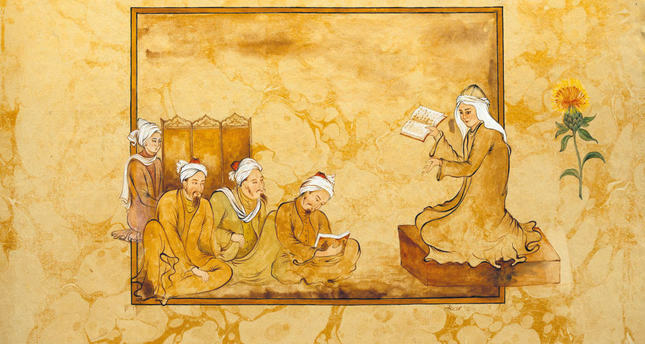 When people had a question or when there was a difficulty in jurisprudence, this "committee" would help find an answer to the problem.Although her new husband was well-educated and knowledgeable, Samarqandi's knowledge and jurisprudential ability surpassed his. In fact, Kassani would often turn to her for advice on fatwas or other matters. It is reported that Ibn al-Adim, the famous 13th century biographer of Aleppo, said: "My father narrated that … her husband sometimes had doubts and erred in the issuing of a fatwa. She would then tell him the correct opinion and explain the reason for his mistake." A student of Kassani reported: "Sometimes the students would ask al-Kassani difficult questions. He would ask our leave and go to his home. When he came back, he would answer our questions in detail. This happened quite often. Finally, we understood that Imam Kassani was going home to ask Fatima about the question and then returning with the answer. "Samarqandi was respected by the rulers of the era. She and Kassani moved to Aleppo and Damascus and were shown courtesy by the Aleppo Atabeg Nureddin Mahmud Zengi. He wanted to learn from Fatima and would ask for her advice on important matters. Samarqandi was not only a great scholar, but was also a charitable woman. During the month of Ramadan in Aleppo, she sold her bracelets to pay for a meal to give to the jurisprudential scholars in Aleppo, thus acting as a pioneer in a tradition that would continue for centuries. Samarqandi was also a great calligrapher. She would prepare fatwas with great care, writing them herself and would get the signature of her husband and father. She would then deliver the fatwa to the recipient. Thus, these fatwas were not only very reliable and respected, but were works of art in their own right. This strong, resilient and intelligent woman who had authority in a number of areas and who was influential in the societies she lived in, died and was buried in Aleppo. However, despite her great skills and abilities, this important person, like so many other women in history, is not sufficiently appreciated. Her legacy has been largely overlooked and she was abandoned to the shadows of oblivion. Who knows where her works on jurisprudence and the hadiths or the fatwas she created are lying; perhaps in some far flung library covered in dust. Perhaps they have been stored in one of the libraries that are being burned down by the ignorant people in different parts of the Middle East today.There are many women like this in the past; women who had authority, who had skills and who were respected in their societies. It is time we stop reacting to the existence of such women as shocking, unusual or even surprising. Such women were sometimes so much the norm that they were not even written about by their contemporaries, as they were just part of everyday life. People all over the world are working to uncover these women. It is thanks to one such project, the Muslim Women's Historical Heritage, a project sponsored by the Human Development and Social Education Foundation, that women like Samarqandi are coming to light. The miniature included here is part of this project and is intended to help bring these women back into the light.